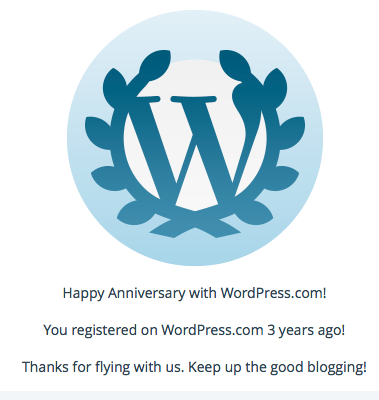 But today is apparently, my 3 year anniversary with WordPress! I got a nifty little notification with some kind of fancy symbol on it telling me I had registered this blog three years ago today. That’s probably worth celebrating and so I’m posting this to commemorate. Also, taking a stroll down memory lane as my past-blogger-self, I have to say — I think I’m slowly getting the hang of this! See for proof my first ever blog post — once you’re done counting all the different color fonts I used (which I’m SURE were clear as mud to read on your mobile device), you’ll probably be tripping over italics and BOLDED THINGS before you actually (mercifully) reach the end. In fact, I just double-checked and uhh.. yeah. You can’t read it at all because I wrote it in WHITE TEXT. I mean. How are you guys still around reading this? For those who have been with me since the beginning — THANK YOU and God bless your tired retinas. Honestly, she’s probably the reason I’m writing this post right now instead of spiraling into the abyss of Facebook or watching another episode of MASH (a guilty pleasure of mine. 11 seasons are now on Netflix. I am not ashamed). So, I HOPE YOU’RE HAPPY JOANNE. But seriously, I want to say thank you to all of you. Whether I’ve met you in real life or just over cyberspace, your encouragement to me to keep writing, the thoughts you share and the insights I get from all of you is priceless. I would have nothing interesting to say and nobody to tell it to if it weren’t for the people in my life. So, this post is for YOU! I raise my fancy-embellished virtual notification to you and say — YOU have made this possible! Thank you for not giving up on me! Thank you for forcing me to write when I don’t want to, for encouraging me to publish more and edit less (ARGH), and for always challenging me to not take any gift or passion lightly. There’s lots of joy to be had in this life (even if it is juxtaposed with loss, sorrow, or anger). I solemnly swear to share as much of it as I can with all of you. Seize the day! Life is short! (if only this blog post was too). « Soil and strollers and a God who makes it all work. Haha Joanne! I just couldn’t resist giving a friendly shout-out to ya 😉 you’ve been such a huge encourager and I’m so thankful for you! Woohoo! Hard to believe, really. 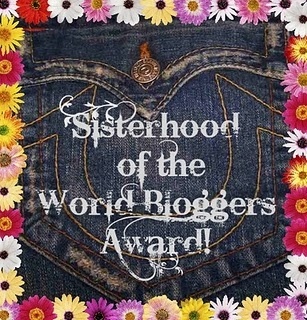 And you’re largely to blame for this I hope you realize 🙂 you were the one who convinced me I should give blogging a shot, 3 years later and I’m still shootin’!